So a few weeks ago, I got some news that did not make me so happy: all departments MUST give common assessments, and my department’s solution to that will be following Realidades. As the only non-traditional teacher (CI and proficiency goals, not grammar goals) in my department, this was VERY depressing news. I might have gone on a rant to several sweet friends and family members about how much I HATE textbooks, how outdated they are, how they stifle creativity, how the vocabulary lists are terribly irrelevant, etc (I must point out that my principal said on the first day of school that if we’ve lost our passion, we need to find a new job. Not a problem here, Mrs. Principal!). I assess reading comprehension, speaking, and writing constantly, but I’m not great at assessing listening or culture. In my department, one of the other Spanish 1 teachers is really passionate about culture, and the other is passionate about listening. Mindset: I have things to learn from them. 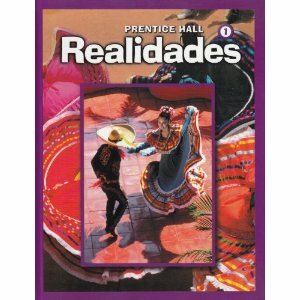 Realidades isn’t that bad – I can use their vocab lists as the “comprehension” base, but I’m not limited to teaching that vocabulary – I can still expand and personalize vocabulary to what is relevant and interesting to students. Mindset: Realidades lists are for comprehension – I’ll keep giving my students the words they need to meet the standard, whether or not they’re on the official list, and students will acquire what they need to communicate. When my department suggested using Realidades tests as the base for our common assessments, I died a little inside. You want me to give my precious babies a TEXTBOOK TEST???? But then I looked at the tests…and they’re not that bad. There’s a format for assessing culture and listening that I can work with, and as long as I get to formally assess writing or speaking each unit, I’m happy. I’ll certainly advocate for assessing grammar in context (please let’s not do verb ending clozes all year), but I’m willing to compromise as long as we write tests that meaningfully assess students’ ability to understand and communicate in Spanish. Mindset: It will actually be easier to adapt the textbook test into something I’m happy with than continue writing tests from scratch. Don’t throw out the baby with the bath water – supplemented with creativity, energy, lots of CI, and authentic resources, the textbook curriculum isn’t bad. This entry was posted in Planning for Learning and tagged assessment, collaboration, Realidades. Bookmark the permalink. 4 Responses to Realidades + Proficiency? Sounds like you have the right attitude about all these less-than-awesome changes! Good luck!